The dead live in the grooves of old 45s, waiting to become music, and the rush of traffic on the highway is the dead saying good-bye. The slow parade of eyes, watching you walk by, the dead live there, too. In the reckless spin of a knife-tip ballerina, the blood of the world’s oldest woman. In the light and shadow that give birth to dislocation, in the statues of antiquity, the green abandoned house where you slept like a rusted engine in an old car, where the fire rose to the roof with the same slow, mechanical movement of a robot’s head. The dead there in all of it. When you speak to the dead, you speak to yourself. You say, I was asleep. Now I am awake. Look how I have grown. Will we be forever the bone of an idea but never the idea, never manifest or sacred, always more like something purchased at the convenience store after filling up, cheap and large, regrettable? Will we be broken as light is broken in water, refracted, a trick? Even in our sleep we can’t forget. Stars eating stars. Blue water stippled with light. A shoebox full of teeth. A dog full of many other dogs. Our cells are being replaced by false cells, mechanical cells, until we are machines that resemble us. We can hear the werewolves singing. They’re so sad, we forgive them all their mayhem. A statue laments a lost finger, weary of the chipped pedestal at its feet and the snow that falls like white spiders all around it. We trade our souls for expensive shoes. 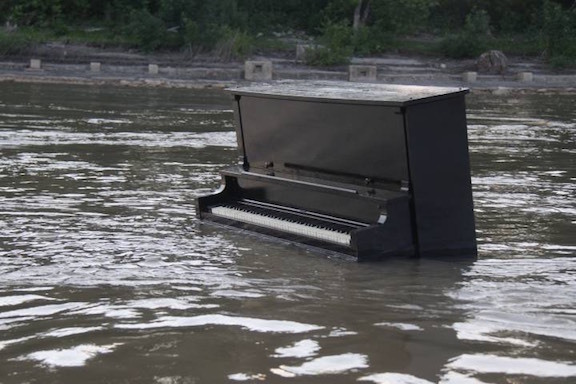 We hope at least our ruins will be spectacular: the loam of eyes from fallen saints, pianos floating on rough waters. The ocean in a shell on our doorsteps. We bloomed radiant habits amid failed resurrections. Just one spark of light, though not satori brilliance. We were neon-less, nicotine-fingered. A warped disc spun on the turntable like a roulette wheel. We closed the door, turned inward wildly, tin foil smudged with tongue prints and blood on the cutting board. We felt the loud guitar, the primal guttural, the female vowels of mourning. When the burn subsided, we looked out the window at the bleached-out rag of sky, luminous behind stark branches. Dramatic shadings appeared, as if birds had flown past without their bodies. We closed our eyes, suddenly very tired, like ones who had wandered too far into the welcoming forest, unprepared for the cold night of everything.